GOB Menorca has written a document addressed to the political parties that are running for the next elections to ask that their public pronouncements on more than a hundred proposals should be clearly presented in their electoral programs. The management of public administrations is very important for obtaining a suitable framework where the economy and the environment are able to thrive. To make that possible, GOB takes the view that the political parties should prioritise a series of questions concerning the current situation and the future of Menorca. Making use of the short time before the autonomous community’s regional, island and local elections, GOB presents a series of proposals that are considered to be essential and achievable in the next legislature. Planning at island level is requested along the coast, and, therefore, the resumption and conclusion to the Insular Plan of the Coast. Avoid pollution entering the sea. Provide information on the use of zoning in coves through mapping applications. 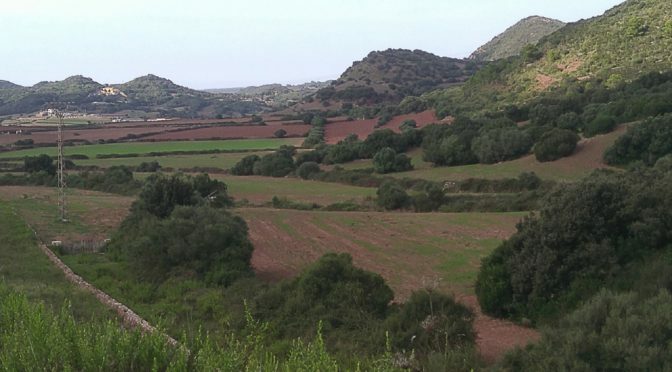 The maintenance of the agrarian landscape is claimed as a fundamental value of Menorcan economy and it is, therefore, requested to put an end to any urbanisation expectations on rural land. Emphasis to be placed on energy saving policies and the fulfillment of the strategy of decarbonization Menorca 2030. The PTI (Insular Territorial Plan) should define the environmental and landscape conditions to ease the integration of photovoltaic parks and wind farms in rural areas. It should also facilitate the investment by institutions and local people in these plants in order to avoid energy production being concentrated in few hands. Deal with the problem of water as that of the whole island. It is believed that it is essential to work to save water, improving infrastructures, revising tariffs and controlling irrigation. In addition, action must be taken on contamination of aquifers dealing with the known sources of nitrates entering the subsoil. Encouragement should be given to responsible consumption and purchasing that incorporate environmental criteria in a way that promotes local environmentally friendly products having respect for the land, including energy saving, waste consideration, careful use of resources and avoidance of pollutants. Action needs to be taken on the reduction of waste of all sorts and on the implementation of collection and treatment systems which allow for sorting and reducing as much as possible before entering landfill. Entrepreneurship should be valued and promoted from the point of view of Social economy and Circular economy. Industry should be open to making use of the island’s raw materials, innovating and looking for new business lines. Local products of quality, with the added value of being environmentally friendly, should be promoted. They could promote dietetics industries, health food shops and non prescription medicines. Another area to encourage is that of information technology which should be supported by the continual improvement of telecommunications infrastructures. Restructuring of establishments and tourist areas must be made with criteria for the reduction of hotel spaces and the adoption of the current urban parameters, with the object of reducing the human pressure and impact on the environment as well as increasing the quality of tourist attractions. Tourism needs to invest in diversification. It has been improved by offering nature, walking, sailing, scuba diving, gastronomy, the island’s historic heritage and archaeology, etc. It is important to involve people in the debate of what is required in the evolving model of tourism in Menorca. Attention should be made to symptoms of overcrowding and resolutions to the problems found. An effort must be made to encourage the involvement of all the population in the problems of the community, encouraging citizen participation as well as social organizations taking part in the management of activities of public interest. The importance of non-governmental organizations is the backbone of society. The requirements for a Reserve of the Biosphere still need to be fulfilled. This is just an outline of what we hope will encourage you to be involved and generate a constructive debate on the future of Menorca. In the opinion of GOB there is no possible future economy without promoting a one that is sustainable moving away from an economy of speculation.